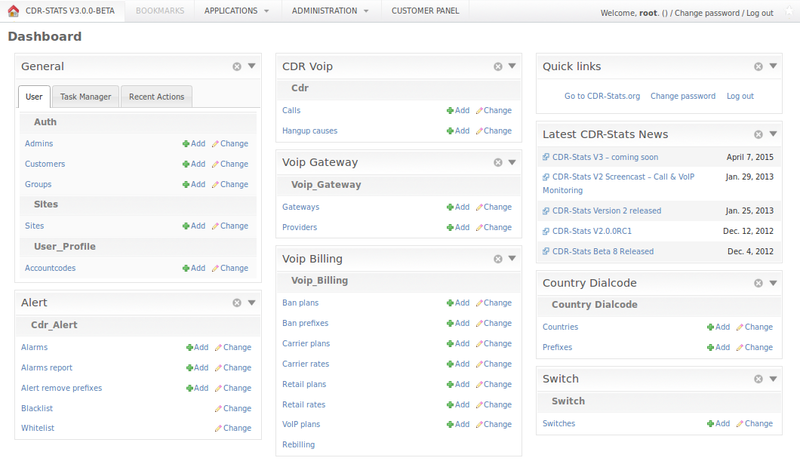 CDR-Stats is free and open source CDR (Call Detail Record) mediation, rating, analysis and reporting application for Freeswitch, Asterisk and other type of VoIP Switch. It allows you to interrogate your CDR to provide reports and statistics via a simple to use, yet powerful, web interface. It is based on the Django Python Framework, Celery, Gevent, PostgreSQL and InfluxDB. CDR-Stats is an application that allows rating, browsing and analysing CDR. CDR Stats uses PostgreSQL, a scalable, high performance database system used to analyse large quantities of CDR data. PostgreSQL provides Materialized views which make it perfect to build analytic application which do heavy aggregation and recently PostgreSQL cames with Jsonb field which make it easy to store custom data from variety of switch. Out of the box, CDR-Stats supports Freeswitch, Asterisk, Kamailio, SipWise, Veraz using connectors that get the CDRs and push them to centralized database. Connectors any switch systems can be built. User Dashboard provides realtime monitoring of the most relevant metrics of connected switches. The Admin Panel allows the administrators to configure the entire reporting platform, import CDR in CSV format, configure users, switch connections and automatic alarms. CDR-Stats uses PostgreSQL as the underlying CDR store. PostgreSQL with Materialized view allows querying and analysis of many millions of records without noticeable loss of performance, and can easily be scaled as demand increases. Celery, a task manager runs in the background, and monitors the CDR coming into the system, and alerts the systems administrator when unusual behaviour is discovered. What is determined as unusual behaviour is determined by the administrator who can configure alerts for increases in dropped calls, average length of calls, or calls to unusual destinations. CDR-Stats works hand in hand with CDR-Pusher which has been built to create an totally independent, easy to install, high performance CDRs Collector. CDR-Pusher is installed on your local Telcoms Switch (e.g. Asterisk), the application will harvest CDRs in Realtime and push them to a central CDR-Stats Database. 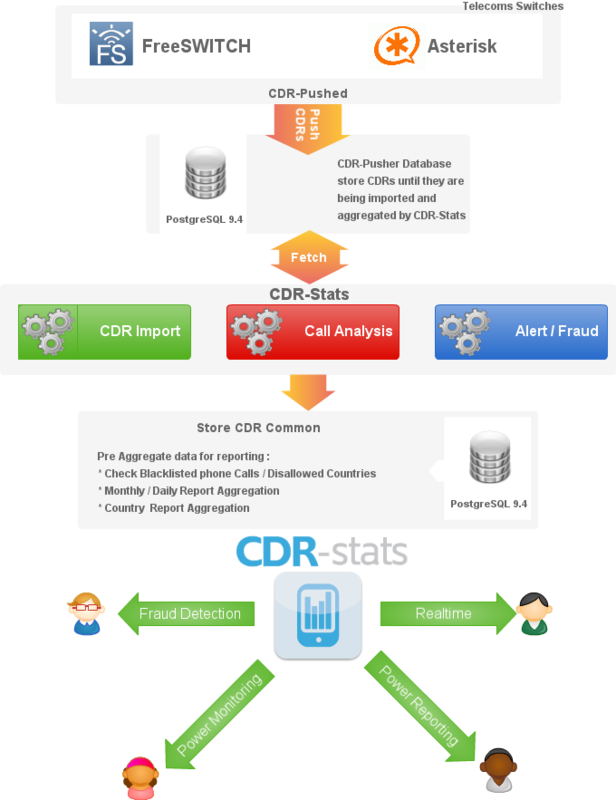 Many features are provided on CDR-Stats, from browsing millions of CDRs, call rating, providing efficient search facilities to build reporting such as monthly reports and comparing call traffic with previous days. 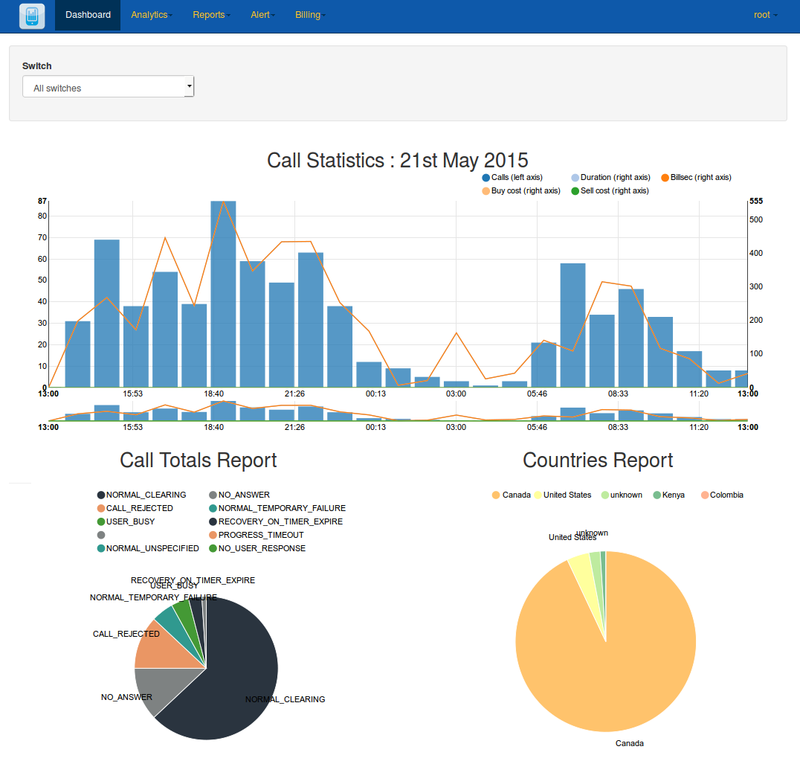 Telephony Reporting Leading open source switches Freeswitch, Asterisk, supported as standard. Multi-tenant Sllowing many customers to monitor their own CDR on one instance of CDR-Stats. Distributed Runs on one or more machines. Supports broker clustering and HA . New workers can be set up without central configuration. Fraud detection Visualise traffic which helps to identify unusual patterns. Error Emails Can be configured to send emails to the administrator if a tasks fails. Compare traffic See how your traffic evolves, and patterns change. CDR-Stats is a simple-to-use tool to provide easy rating and analysis of calls. It is a recommended addition to telephony servers, whether it be a simple in-house PBX or large capacity VoIP switch. It shows in in near realtime what calls are going through, can detect errors and failures, and alert the systems administrator is unexpected traffic is noted.